As today's Fabergé Friday coincides with the full moon, I made sure to find an object that resembles the moon. And this is what I found - a little box made by workmaster Feodor Afanassiev, sometime between the years 1896 and 1908! The ovoid gold box is covered in oyster enamel over a guilloché ground. 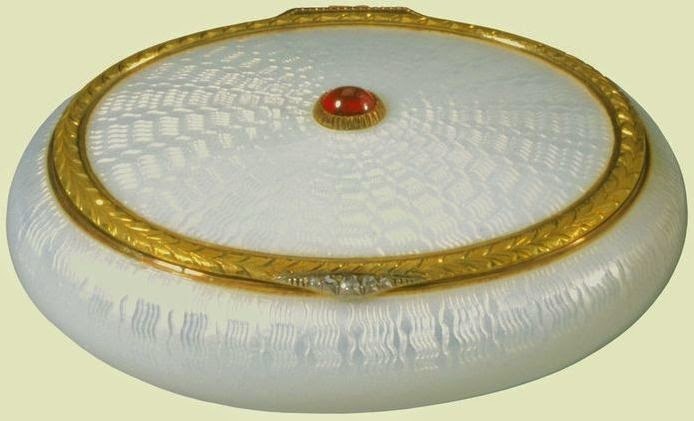 The laurel border around the lid is in two-colored gold, with a diamond set thumb-piece. The center of the lid is set with a cabochon ruby. The size of the box is 0.8'' x 2.1'' x 1.6'' (2.1 x 5.3 x 4.0 cm), and since 1953 it belongs in the Royal Collection.